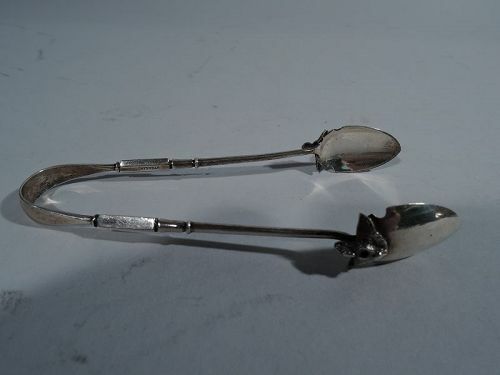 Aesthetic sterling silver tongs. Made by Wood & Hughes in New York. U-form terminating in shallow oval bowl and 3-tine shank. Ornamental piercing. Stylized ornament comprising flower on stippled multifoil heightened with pointille. Engraved 3-letter monogram. 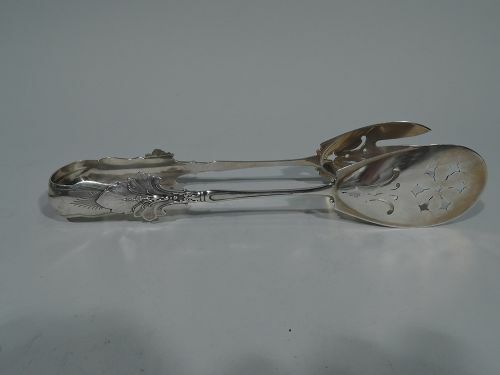 An exciting serving piece from the 1870s-80s in a pattern sometimes called Lotus. Hallmarked. Very good condition. 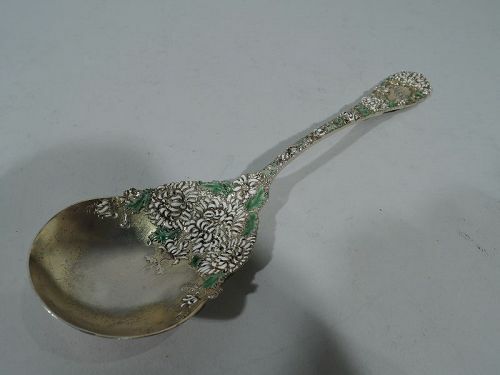 Antique Japonesque gilt sterling silver and enamel berry spoon in Chrysanthemum pattern. Made by Durgin in Concord, New Hampshire. 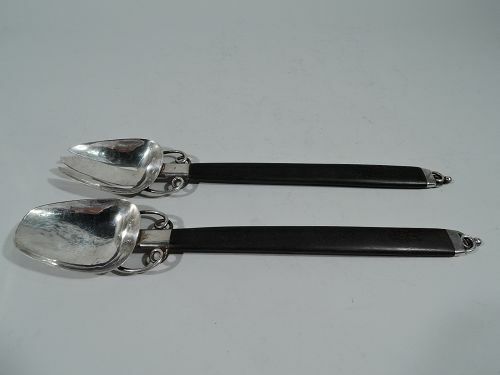 Tapering handle with round terminal and oval scalloped bowl. Raised double-sided ornament comprising dense flower heads and leaves. 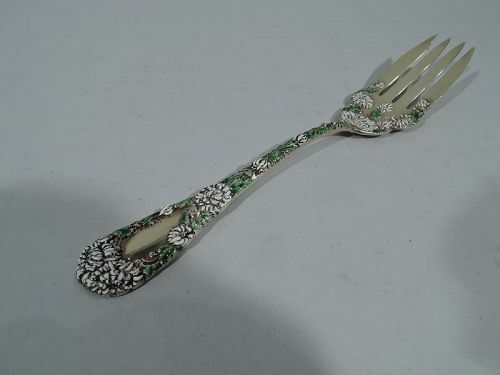 Flowers heightened with white and green enamel on front. Oval frame engraved with interlaced script monogram. An early piece in this pattern, which was first produced in 1893. Hallmark (ca 1853-ca 1905). Very good condition. 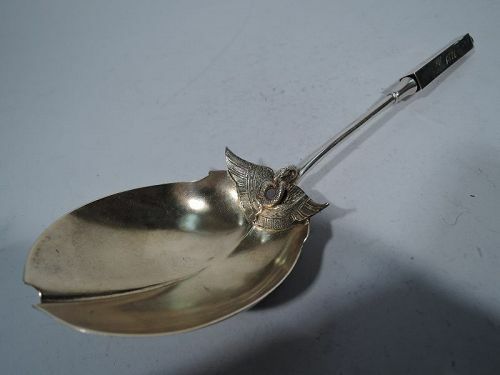 Japonesque sterling silver fish server in Hizen pattern. Made by Gorham in Providence. Rectilinear handle with flying crane, carp in wave, and flowers set in shaped frames and on wavy and patchwork grounds. 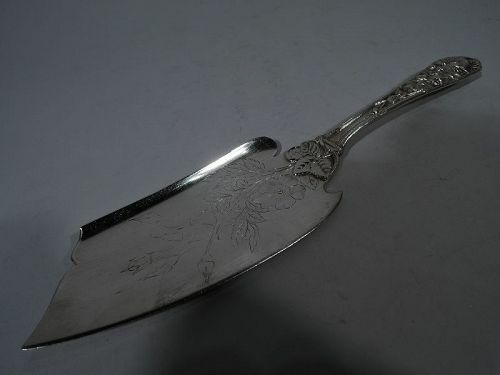 Blade had scalloped top and engraved blossoming branch. A beautiful piece in this pattern, which was first produced in 1880. Late 19th-century hallmark. Excellent condition. 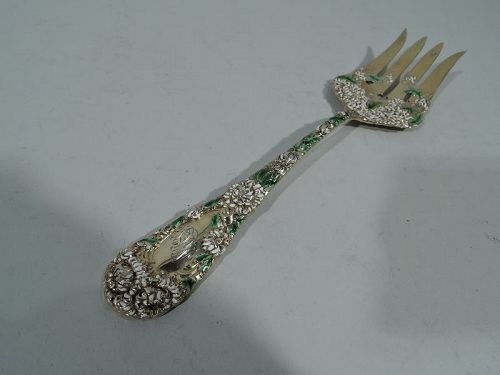 Antique sterling silver fish slice in Eglantine pattern. Made by Gorham in Providence. Dense repousse flowers and oval frame (vacant) on back. 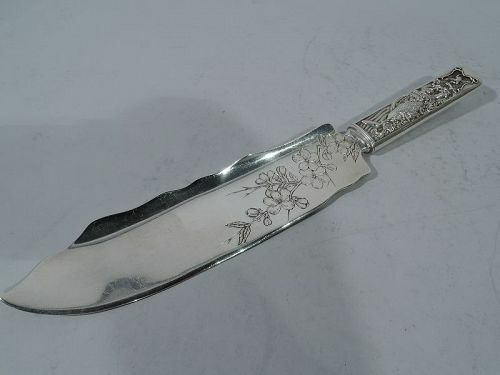 Shaped blade with engraved flowers. A nice piece in this early pattern, which was first produced in 1870. Nineteenth-century hallmark. Very good condition with attractive period wear. 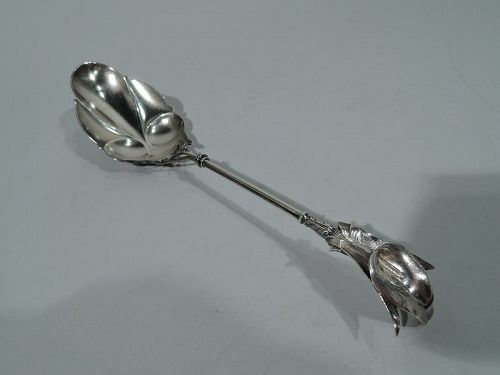 Antique sterling silver berry spoon in Cambridge pattern. Made by Gorham in Providence. A pretty pattern with trefoil terminal decorated with scrolls and flowers. Bowl large and ovoid with gently pointed tip. Hallmark includes patent year 1899. Very good definition. 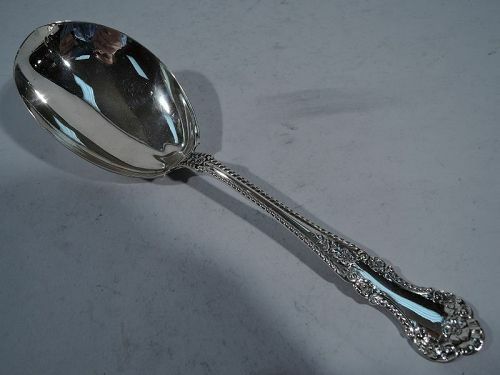 Sterling silver stuffing spoon in medallion pattern. Made by Bailey & Co. (predecessor to Bailey, Banks & Biddle) in Philadelphia, ca 1870. Curved handle terminating in oval medallion applied with centurion’s head on engraved linear ground. A great piece by a regional maker in the fashionable classical motif. The stylized flower and leaf mounts are forward-looking touches. Pointed ovoid bowl. 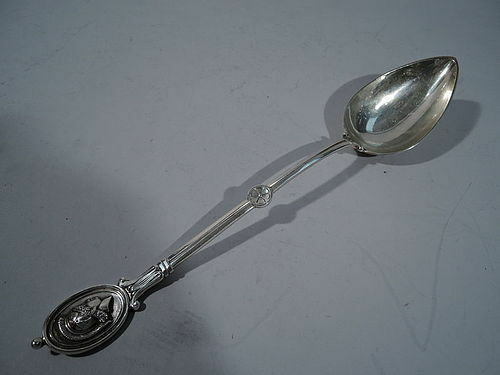 Hallmarked Bailey & Co. (1846-78). Very good condition with rich patina.